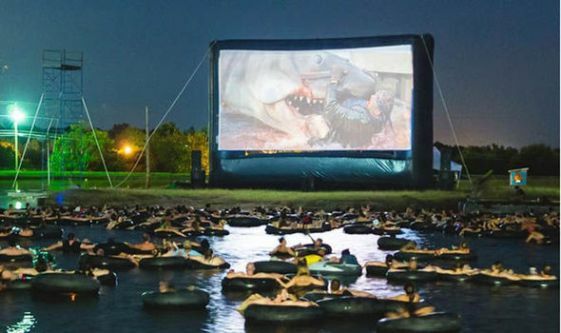 Comments: A screening of Jaws (USA 1975), Steven Spielberg’s film about a shark terrorising a beach resort, at the Alamo Drafthouse, New Braunfels, Texas, where audiences watch the film from rubber rings floating in a lake. The Alama Drafthouse ski ranch and entertainment complex first introduced the ‘Jaws on the Water’ concept in 2002. This entry was posted in 2010s, Photographs, USA and tagged Floating, Horror, Jaws (1975), New Braunfels, Open air. Bookmark the permalink.